The magic of San Francisco during the holidays is too perfect to resist. The events and attractions happening in this beautiful California city offer the RV vacationer a real treat for Christmas and the weeks following. A winter RV trip to San Francisco means you don’t have to worry about expensive stays in hotels. 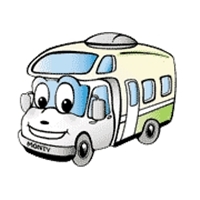 You can fly in, rent your motorhome and begin your adventure. A great place to camp is the San Francisco RV Resort which is a short fifteen-minute drive from the heart of the city. First stop can be a tour of wonderful giant gingerbread houses at different locations throughout the city. See these amazing constructions of icing, candy, sugar and chocolate. Some have multiple rooms and one even has a chocolate pond! If kids are with you, it will be a wonder to watch their faces light up! A favorite treat for the holidays is stopping to see the huge Union Square Christmas tree, decorated with the best ornaments and lights. The City by the Bay certainly knows how to welcome in Christmas and all the celebrations that go along with it. At the Cheesecake Factory you can look down at the tree and enjoy one of the best views. Go ice skating while here and then shop for all those special gifts of the season. Despite the chilly weather, you will want to get outdoors for some fun. There are more than a thousand acres at Golden Gate Park and many sights to see indoors as well. Warm up by visiting Steinhart Aquarium. Here you can see the graceful beauty of marine creatures and have a laugh at the antics of penguins. Another place you won’t want to miss on your holiday San Francisco trip is Fisherman’s Wharf. The fishing fleet at the wharf has the boats decorated, which adds a unique touch to the holidays. Taste the Dungeness crab as you warm yourself in one of San Francisco’s Fisherman’s Wharf eateries. You can relax in style and dine while absorbing the ambience of the harbor activities. Ready to get outside again? Head to Embarcadero Marina Park North to find biking and hiking paths, a fishing pier and spots for a picnic. You can fit in some exercise by trying out the exercise stations. As you fish, you will realize that San Francisco has it all – and any time of year! At Coit Tower you will reach the observation deck and be able to take in the city in one sweeping 360-degree view. The murals inside the base offer a look at the work of artists from the early 1930s. As you travel around and take in all the sights and sounds of San Francisco, certainly one of your favorite sounds will be the ding-ding-ding of the cable cars. You can ride to many of the most popular sights in the city on these historic cars. Yes, you will never forget an RV adventure to San Francisco for the holidays. A wonderful Christmas treat for any family! Picture credits: The picture of the cable car in San Francisco, California, is from the Wikimedia Commons. It is licensed under the Creative Commons Attribution-Share Alike 3.0 Unported license. This entry was posted in California RV Camping Vacation. Bookmark the permalink.